CFE/Save the Sound is always pleased to work with landscape architects, engineers, and contractors to implement habitat restoration, streamside buffer, and green infrastructure projects that filter stormwater runoff and improve river habitats. 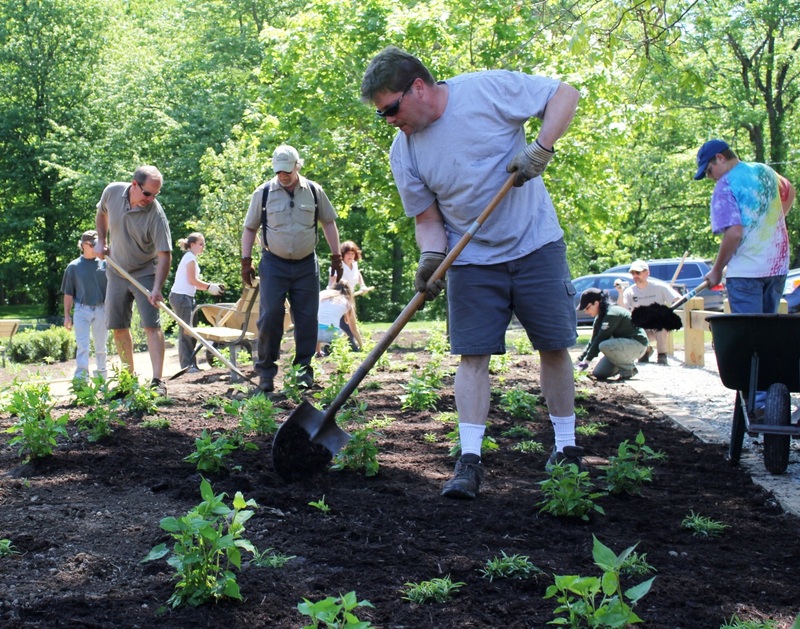 In 2012, we coordinated volunteers to plant native shrubs at an ecological pond restoration and stormwater management project at Trumbull’s Old Mine Park, designed by Site Systems, Inc., a landscape architecture firm based in Trumbull. Site Systems’ Oliver Gaffney contributes this week’s Fridays in the Field post about the Old Mine Park project’s design and ecological benefits. 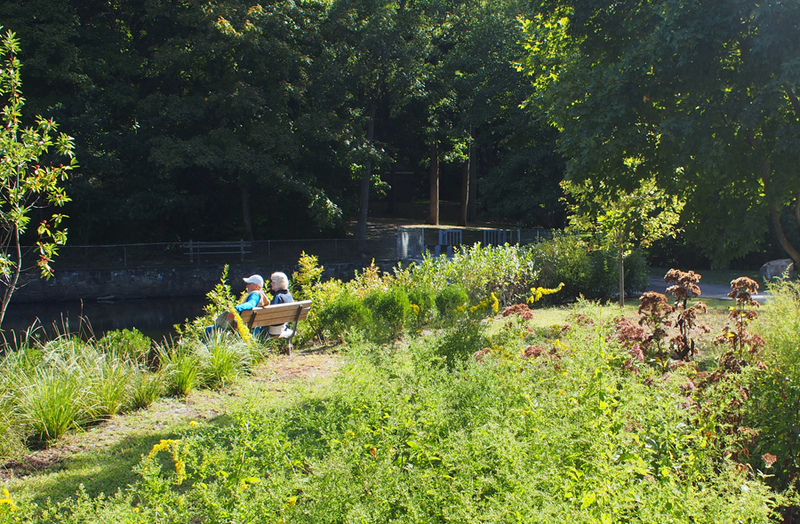 Advocating for native plantings and green infrastructure is a natural extension of Joanne Parsons’ involvement with the Town of Trumbull’s Conservation Commission, where she helps oversee the protection and supervision of natural resources in town. When the Commission saw an opportunity to take a different approach to a pond restoration project in Old Mine Park, her extensive knowledge of drainage, planting design, and other aspects of the landscape architecture profession became valuable assets. Joanne and Dale Parsons’s firm, Site Systems, Inc., was chosen to design a beautiful and environmentally-friendly planting plan for the project. 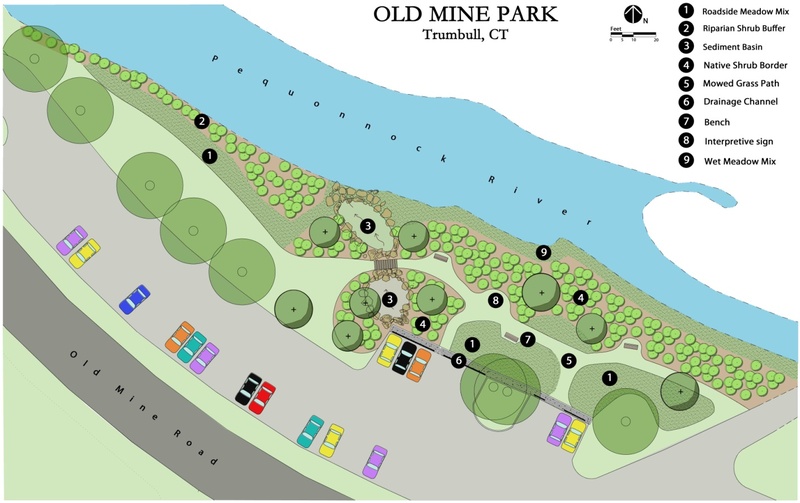 The Old Mine Park Pond Restoration was the first of what will be several model projects by the municipalities of Bridgeport, Trumbull and Monroe under the Pequonnock River Initiative. Formed in 2010 as a partnership between the three municipalities, Save the Sound, and the Southwest Conservation District, this watershed-based plan seeks to restore the Pequonnock River to a natural and sustainable ecosystem by improving water quality, increasing native habitat, and promoting sustainable land use strategies. Funding for this project was provided by the Anne S. Richardson Fund, with matching contributions from the Town of Trumbull. The Town of Trumbull Parks Department graded the site, constructed the engineered drainage system and planted large trees. Volunteers from the surrounding areas offered their time to install the shrubs and herbaceous plants. Demonstration pilot projects, such as Old Mine Park, would not be possible without grant funding from Section 319 of the Clean Water Act. Amendments to the Clean Water Act in 1987 created the Section 319 Nonpoint Source Management Program which supports public outreach, training, pilot projects, monitoring, and other activities that contribute to controlling nonpoint source pollution. The Pequonnock River Initiative, which identified Old Mine Park as a pilot site, was funded by a Section 319 grant. 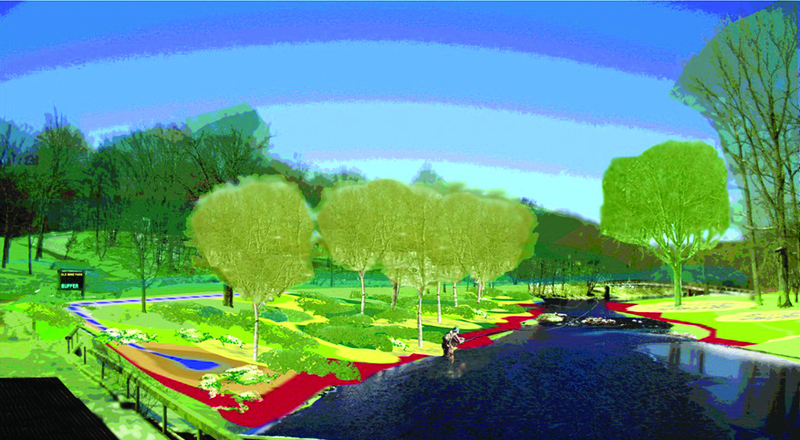 The original pond dredging restoration plan for Old Mine Park called for manicured lawn, right down to the water’s edge. But erosion from the paved upland area, which deposited sediments and pollutants directly into the river and pond, degraded water quality throughout the lower Pequonnock River and made the area less resilient to flooding. The new, award-winning design by Site Systems emphasizes Low Impact Development & stormwater best management practices that mitigate the effects of downstream flooding, reduce the amount of sediments and pollutants flowing into the river, and improve the riverbank habitat for native fish and other wildlife. For local residents, a pedestrian bridge, meandering pathways, and benches near the water’s edge invite them to sit for a while and appreciate the various native flora and fauna. 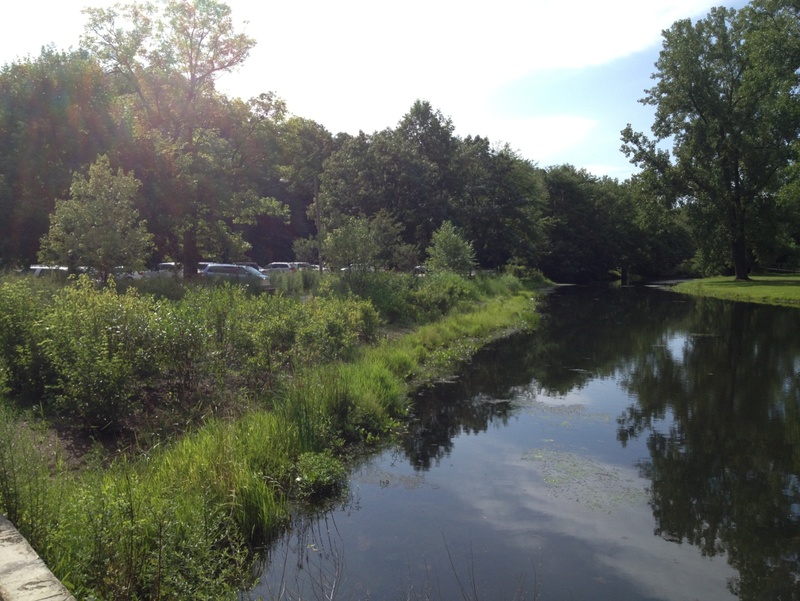 Image Credit: Site Systems, Inc.
Riparian buffers are areas of trees, shrubs, and other vegetation alongside rivers, streams, or ponds that filter sediment and pollutants from stormwater runoff through vegetation and roots. Dense coverage of riverbanks and stream edges helps prevent erosion and reduces the sediments that wash into riparian areas downstream. The extra vegetation also helps slow down the flow of runoff, promoting helpful infiltration that recharges groundwater reserves and preventing dangerous flash flooding downstream. As an added bonus, the fertilizer-laden runoff from lawns and gardens (rich in nitrogen and phosphorus) is absorbed by the soil where plants can make use of it – and not in water bodies where it will cause algal blooms. Larger shrubs and trees provide shade along the water’s edge, helping to moderate temperatures and create viable habitat for cold-water fish such as trout. Meadows are a low-maintenance, native landscape alternative to traditional lawn areas that attract a variety of small mammals as well as predators such as owls and hawks. By providing shelter, food, and nesting material, these ecosystems help protect and preserve dozens of our threatened and endangered native species. At Old Mine Park, two distinct meadows were established: a wet meadow near the water’s edge, and an upland meadow near the parking lot. Along the edge of the Pequonnock River, the wet meadow is part of the riparian buffer and helps intercept and filter runoff. Closer to the parking areas, an upland meadow was planted that can tolerate the drier soils and roadside conditions. 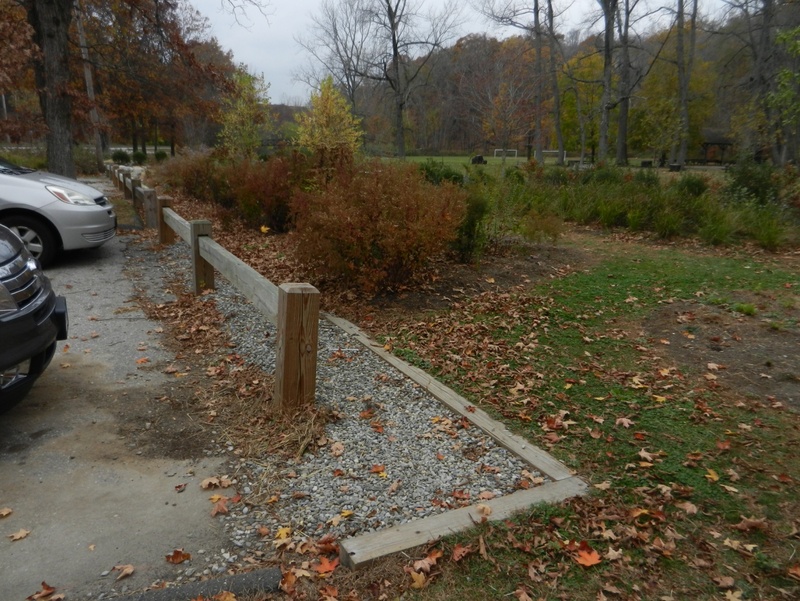 To help collect stormwater runoff, a drainage channel was installed where the parking lot meets the park itself. Water sheets off of the pavement into a gravel strip area where it drains down into a perforated pipe. This pipe then conveys the untreated runoff to the first part of the sediment basin, the forebay, where garbage and large sediments can settle out. The forebay acts as an initial storage area, pretreating runoff by settling out heavier garbage, sediments, and pollutants. A check dam located just before the main sediment basin temporarily detains the water until it reaches the top of the dam and begins to trickle onwards. Despite the lush vegetation surrounding it, the forebay is deliberately left unplanted to allow for easier maintenance and cleaning. 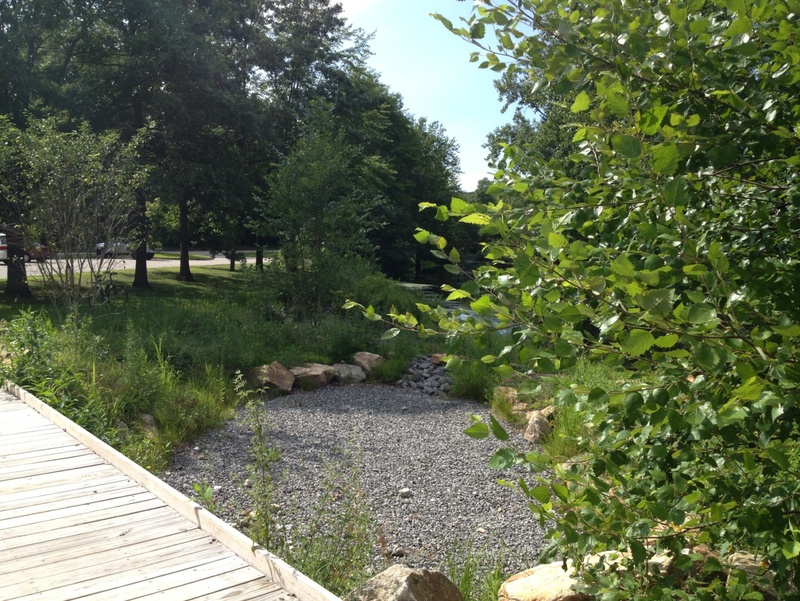 The sediment basin is the final stop for the partially treated stormwater before it reaches the Pequonnock River. This basin is significantly larger than the forebay and is designed to detain runoff for a period of no more than 24 to 48 hours. The vegetation in the sediment basin helps treat some of the pollutants, but most of the heavy lifting is done by soil microbes which gradually break down the pollutants over time. The result is an attractive and functional landscape that protects the river from human impacts and creates beautiful, varied habitat for the benefit of wildlife and local residents alike!